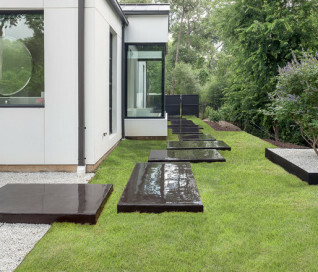 The problem this Memorial-Houston homeowner faced was that her sumptuous contemporary home, an austere series of interconnected cubes of various sizes constructed from white stucco, black steel and glass, did not have the proper landscaping frame. It was out of scale. Imagine Robert Motherwell’s “Black on White” painting without the Museum of Fine Arts-Houston’s generous expanse of white walls surrounding it. It would still be magnificent but somehow…off. 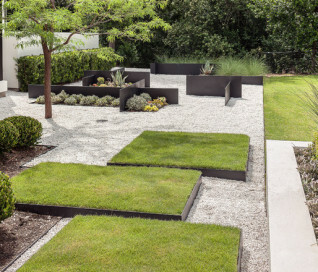 Intuitively, the homeowner realized this issue and started interviewing landscape designers. After talking to about 15 different designers, she finally went with one, only to be disappointed with the results. 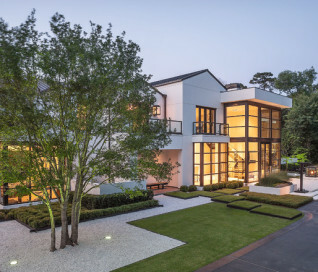 From the across-the-street neighbor, she was then introduced to Exterior Worlds and she hired us to correct the newly-created problems and more fully realize her hopes for the grounds. “It’s not unusual for us to come in and deal with a mess. Sometimes a homeowner gets overwhelmed with managing everything. Other times it is like this project where the design misses the mark. Regardless, it is really important to listen for what a prospect or client means and not just what they say,” says Jeff Halper, owner of Exterior Worlds. Since the sheer size of the house is so dominating, Exterior Worlds’ overall job was to bring the garden up to scale to match the house. Likewise, it was important to stretch the house into the landscape, thereby softening some of its severity. The concept we devised entailed creating an interplay between the landscape and the house by astute placement of the black-and-white colors of the house into the yard using different materials and textures. 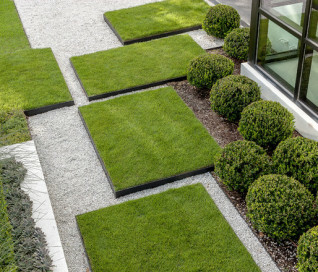 Strategic plantings of greenery increased the interest, density, height and function of the design. First we installed a pathway of crushed white marble around the perimeter of the house, the white of the path in homage to the house’s white facade. 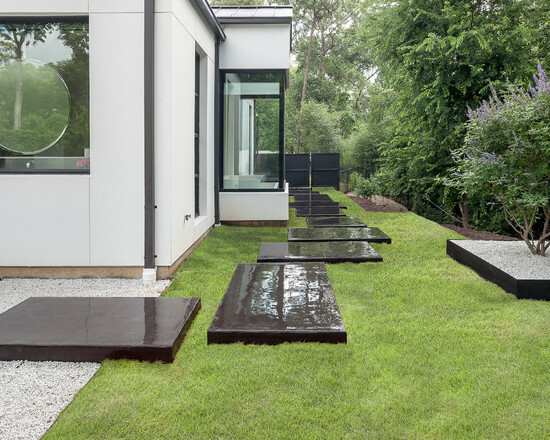 At various intervals, 3/8-inch steel-plated metal strips, painted black to echo the bones of the house, were embedded and crisscrossed in the pathway to turn it into a loose maze. 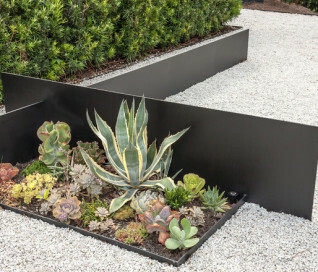 Along this metal bunting, we planted succulents whose other-worldly shapes and mild coloration juxtaposed nicely against the hard-edged steel. 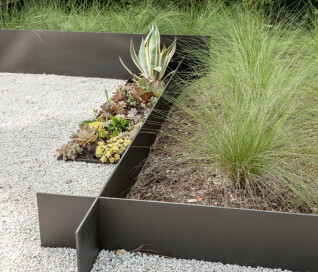 These plantings included Gulf Coast muhly, a native grass that produces a pink-purple plume when it blooms in the fall. A side benefit to the use of these plants is that they are low maintenance and hardy in Houston’s summertime heat. Next we brought in trees for scale. Without them, the impressive architecture becomes imposing. We placed them along the front at either corner of the house. 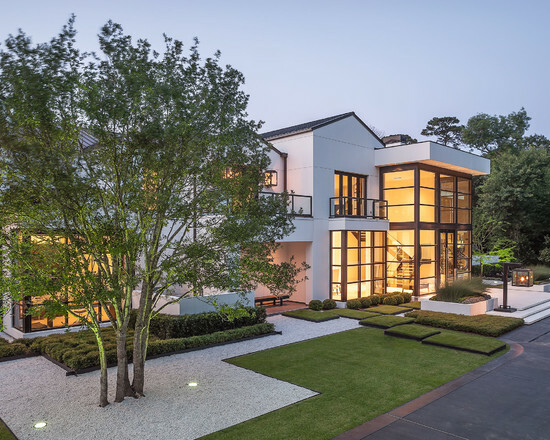 For the left side, we found a multi-trunk live oak in a field, transported it to the property and placed it in a custom-made square of the crushed marble at a slight distance from the house. On the right side where the house makes a 90-degree alcove, we planted a mature mesquite tree. 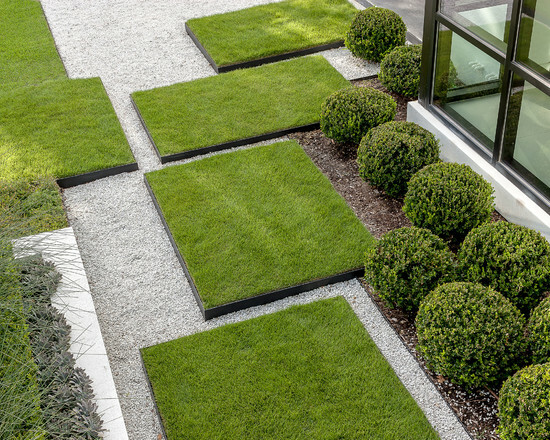 To finish off the front entry, we fashioned the black steel into large squares and planted grass to create islands of green, or giant lawn stepping pads. 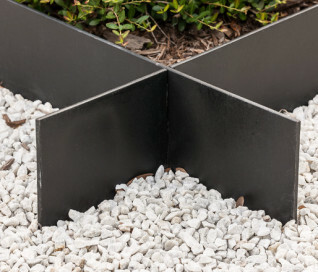 We echoed this look in the back off the master suite by turning concrete pads of black-stained concrete into stepping pads. We kept the foundational plantings of Japanese yews which add green, earthy mass, something the stark architecture needs for further balance. We contoured Japanese boxwoods into small spheres to enhance the play between shapes and textures. 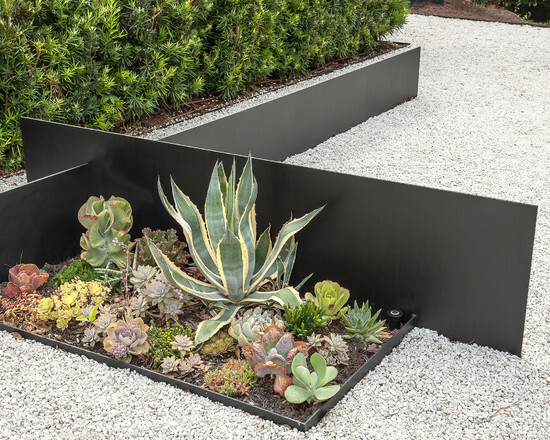 In the large, white planters at the front entrance, we repeated the plantings of succulents and Gulf Coast muhly to reinforce symmetry. 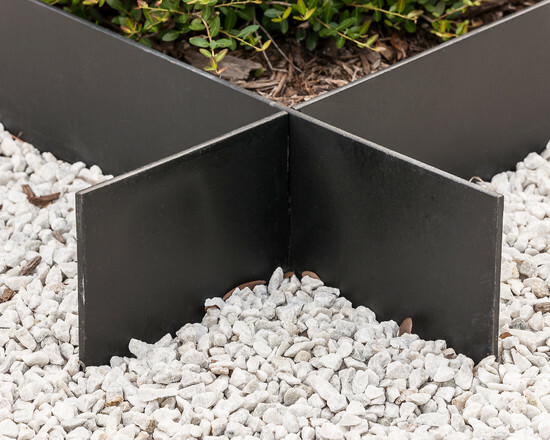 Then we built an additional planter in the back out of the black metal, filled it with the crushed white marble and planted a Texas vitex, another hardy choice that adds a touch of color with its purple blooms. To finish off the landscaping, we needed to address the ravine behind the house. We built a retaining wall to contain erosion. Aesthetically, we crafted it so that the wall has a sharp upper edge, a modern motif right where the landscape meets the land.